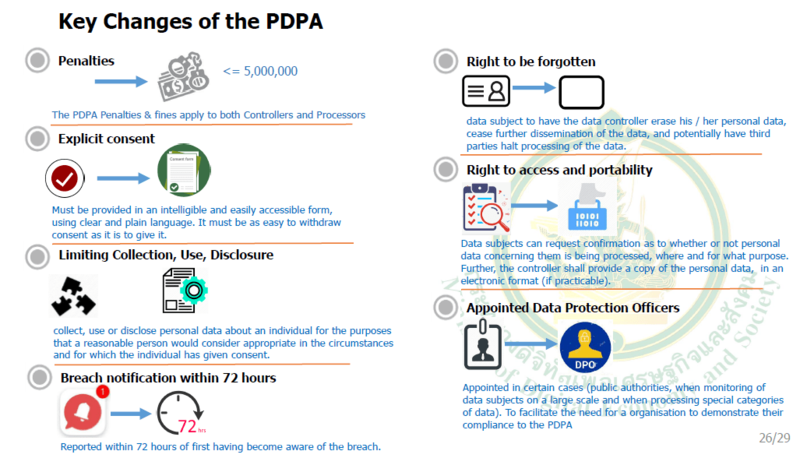 After numerous attempts over nearly two decades, Thailand’s Personal Data Protection Act was finally approved and endorsed by the National Legislative Assembly (NLA) on Feb 28. Drafted in an attempt to mimic the EU’s General Data Protection Regulation (GDPR), the act will be submitted for royal endorsement and subsequent publication in the Royal Gazette. means any private information, which is able to identify any person directly or indirectly. means any person or juristic person who has an authority to consider for collecting, using and disclosure of personal data. means any person or juristic person who operate any collect, uses and discloses of personal data process in related to the order of Personal Data Controller. Data controller can use personal data in accordance with the objectives already notified to the data subject prior to the enforcement of this Act, and must be defined method for cancel consent. to rectify: can request their data be updated or made complete. to forgot: right to withdraw his or her consent or delete or destroy the data when Data controller fails to comply with the rules under this Act. to data portability: can request a copy of their data in digital format.